For pricing and additional information about outfitting your faculty, click here to contact us. black to match the gown. Holds the hood together and gives it shape. Indicates the degree earned by the wearer. The most misunderstood, most improperly worn piece of academic regalia is the hood. Yet, it is the most important part as it identifies the degree earned by the wearer and the institution awarding the degree, Basically, it is a color-coded system. The hood for this degree lies flat. The gold binding indicates the wearer has earned the degree of Associate in Science. The navy blue and white chevron reflect the official colors of the institution. In most cases the field is black. The hood shown reflects a red field for the third color of the institution. The hood for this degree (Bachelor of Education - B,Ed. 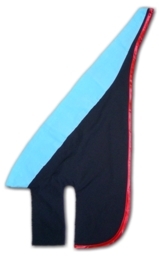 as indicated by the light blue velvet trim) should be draped so that the institution's official colors and design (red field with a white chevron) on the lining are more visible. This can be done by turning the velvet trim to the outside at the back just below the shoulders. The hood for this degree (Master of Science - M.S. as indicated by the golden velvet trim) is correctly draped. Notice the velvet trim has been turned just below the shoulders (at the button and cord) so that the lining (red field with white chevron) appears at all times. Additional hood specifications require that hoods be lined with the official color or colors of the college or university conferring the degree. More than one color is shown by division of the field using a chevron, multiple chevrons, reverse chevrons, equal division or any pattern specific to the institution and as approved by the American Council on Education. For economic reasons, the lining at the souvenir quality level (outfits designed to be kept by the students after graduation) are the same or similar fabric as the shell. Velveteen is used in place of velvet for the degree color trim. The trim color should indicate the subject to which the degree pertains, as outlined on the chart below. As an example, the trim color for the degree of Master of Science in Education should be light blue representing education, not yellow representing science. 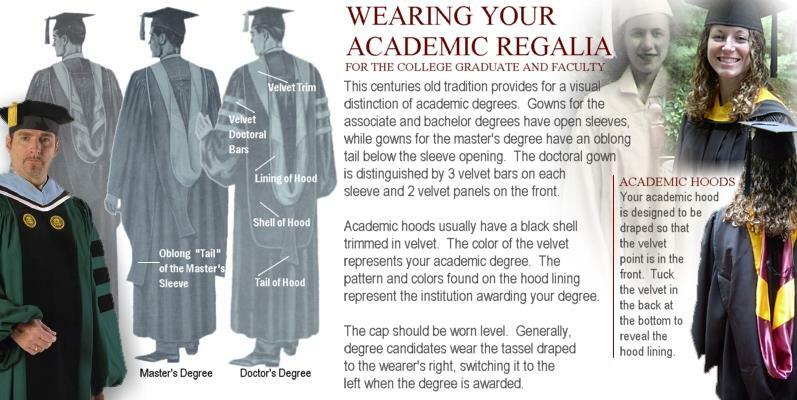 No academic hood should ever have the velvet trim divided to represent more than a single degree or discipline. For simplicity, some institutions have adopted guidelines whereby disciplines are not recognized as part of the hood. Rather, they may categorize specific disciplines as science, arts and letters or education. As an example, the trim color for Bachelor of Arts in Journalism would, in this case, have white trim (arts and letters) and not the more specific breakdown for journalism, crimson. 1 Sullivan, Eugene, An Academic Costume Code and An Academic Ceremony Guide, American Council on Education, Washington, D.C. 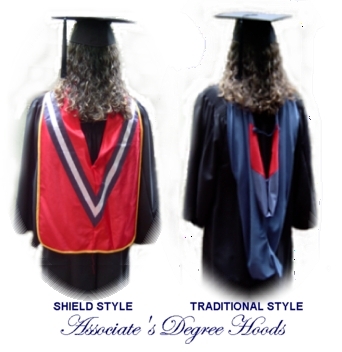 The shield cut for the associate's degree hood is the more preferred style in use at colleges and universities nationwide. The shield style is edged with cording or a binding in the degree color (i.e., golden yellow for science; white for arts). The institution's colors are found on the chevron. The hood generally has a field of black. The hood shown above features a field of red for the third color of the institution. The traditional or "bachelor's style" cut follows the same pattern as the hood for the bachelor's degree, less the velvet trim. The shell is generally black with a lining in the colors and pattern indicative of the institution awarding the degree. Cording or a binding in the degree color edges the hood where the shell meets the lining. 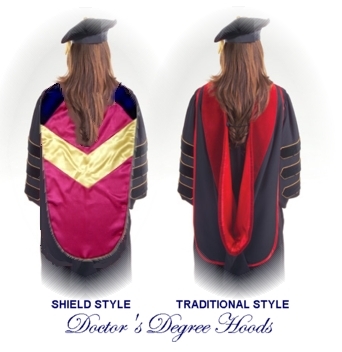 The traditional cut doctoral hood is the more widely used style. It features a black shell, velvet trim that extends around the neck, over the shoulders and down the back, and satin lining in the official colors and pattern of the institution. The newer shield cut addresses the age old problem of improper draping of the hood. The hood is designed to lay flat against the back making it easy to position and keep in position while worn. 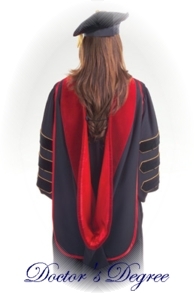 The velvet drapes around the neck and over the shoulders to a point where the satin lining of the institution's colors and pattern complete the back portion of the hood. This newer shield style design is generally part of unique doctoral outfit designs adopted by colleges and universities. 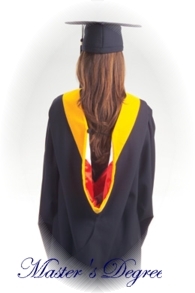 There is a difference in gown design for academic degrees. 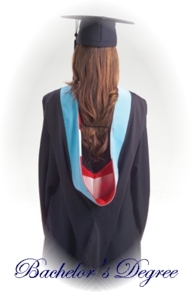 The style gown for both the Associate's and Bachelor's degrees are of the same design. The gown features open, pointed sleeves. It is designed to be worn closed. Bachelor's gowns are generally black while Associate's gowns can be black, or a color lighter than black. 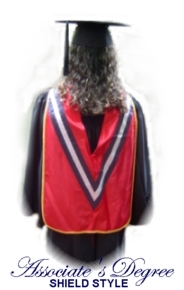 Some institutions have adopted color and other modifications to the traditional gown at the Bachelor's level (i.e., Boston University uses a red gown with black mortarboard; Harvard University uses a black gown with embroidered patches in the degree color placed at chest level). The gown should fall no lower than mid-calf. The style for both the Master's and C.A.G.S. degrees differ from the Bachelor's style in that it features an oblong sleeve, open at the wrist. The oblong shape in square cut in the back, with the front section tailored with a arc cut. Although most prefer to wear the gown closed, academic protocol permits it to be worn open or closed. 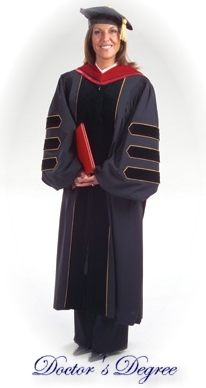 Some institutions have adopted color and other modifications to the traditional gown at the Master's level (i.e., Boston University uses a red gown with black mortarboard; Harvard University uses a black gown with embroidered patches in the degree color placed at chest level). Doctoral gowns feature 3 velvet bars on each sleeve and 1 vertical panel down each side of the gown on each side of the gown opening. Velvet panels and bars are generally black, but may be in the color representing the degree (see chart above). The gown has bell-shaped sleeves. It can be worn open or closed. Numerous colleges and universities have adopted modifications to the traditional design making the design specific to that institution. Such modifications generally include a color fabric other than black, piping around the velvet panels and bars with embroidered patches of the institution's crest placed on each panel at chest level. The mortarboard cap is the traditional style for use with academic regalia. This style cap is the standard for all degree levels, but can be substituted with a velvet tam at the doctoral level. A long tassel is fastened to a button on the top middle of the cap. The tassel should be black or the appropriate color assigned for the subject area (see chart above). Those with doctoral degrees may have a gold tassel if permitted by the institution awarding the degree. Which side should the tassel be draped? 2 Sullivan, Eugene, An Academic Costume Code and An Academic Ceremony Guide, American Council on Education, Washington, D.C.
Every Commencement should be an interesting, dignified, colorful and impressive event. Adding to the dignity of the Commencement is your professional staff properly outfitted in the colorful regalia of their college degrees. The attendance of faculty effectively contributes a high level of professionalism to the graduation ceremony. 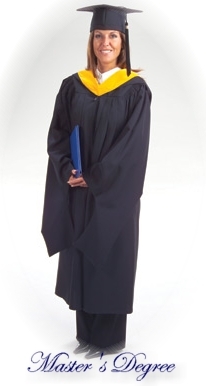 The process of outfitting your faculty is not complex when you order from University Cap & Gown. We have been properly outfitting faculty as far back as the 1920's. Once we obtain the needed information from each administrator and faculty member we begin the process of properly outfitting each person to the specifications approved by the American Council on Education. Your order is packed and labeled individually for each member of your staff. The proper outfit for each administrator and faculty member can be inexpensively rented from University Cap & Gown, or purchased using a variety of purchase plans available.